In this week’s video, I expand on those ideas and show you how to use mindfulness to change the way you think about and relate to pain, so that pain and other uncomfortable sensations become more manageable, even if you can’t do anything to actually stop the pain itself. 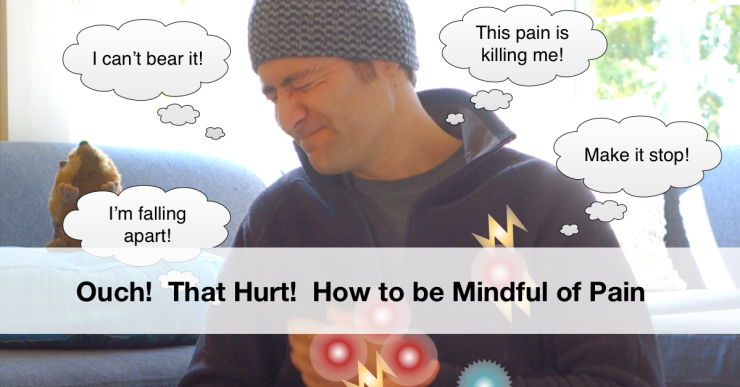 In this video, I’m going to give you some practical suggestions for being mindful of pain, both while meditating and in your daily life. Let me start by saying that what I’m going to show you isn’t necessarily going to make your pain go away. But it can change the way you think about and relate to pain, so that pain and other uncomfortable sensations become more bearable. So they become less of a problem for you. Now, being in pain or physically uncomfortable can obviously be a very unpleasant experience. Depending on the intensity of the discomfort, it can be pretty hard to bear. That being said, often the physical discomfort is only a small part of the picture. The majority of the suffering usually comes from the mental anguish we experience that’s related to the pain. Well, let me answer that question by asking another: what is pain? If you look at it closely, you’ll notice that pain has two parts to it: a physical part and a mental part. The physical part is the cluster of physical sensations you are experiencing. They come in many different flavours, such as stabbing, piercing, itching, burning, throbbing, and so on. The mental part is the mental elaboration about the physical sensations. It’s the stories we tell ourselves about the pain. Things like, “this pain is killing me”, “I don’t think I can bear it”, “I need to get rid of it”, “my body must be falling apart”, “I’m a bad person because good people don’t have pain like this”, or whatever it happens to be for you. The physical sensations can be very uncomfortable – they can really hurt. But, quite often, the mental elaboration is what causes the real anguish. It’s the mental pain and stress that can feel even worse than the physical stuff. Believe it or not, this is actually really good news, because even if there’s nothing you can do about the physical side of the equation, the mental side you can work with. 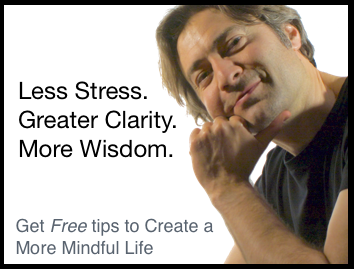 By using our favourite tool, of course, Mindfulness! Remember, mindfulness is a receptive form of observation where you just observe what’s going on, with curiosity, and don’t try to change it in any way. So, when you’re experiencing pain or other uncomfortable sensations, the prescription is to start by observing the physical sensations with as much equanimity as possible. Just let them be. Don’t try to push away or resist the pain. Just let it flow in the body. When you do this, you’ll notice a few things. First, you’ll notice that the physical sensations are constantly changing. They ebb and flow and change form, spiky one moment, dull and achy the next, and so on. They also move around, expand and contract. There are even times when you can’t really say that the sensations are actually painful. In fact, as strange as it may sound, there’s usually even some pleasant sensations buried in there. Second, you’ll notice that the more you give space to these sensations, the more you allow them to inhabit your body, the less mental elaboration you’ll have about them. That’s because when you resist or guard again the pain, that aversion fuels the mental elaboration. When you allow the pain to be there, there’s just a flow of sensations that are constantly changing, and there’s much less mental story telling about it. And third, as the mental elaboration quiets down, you’ll notice that the pain seems more bearable. It won’t necessarily go away, in fact, it often doesn’t, but it feels more manageable. That’s because you’re making the shift from it being “your pain”, something you identify with, to being just a bunch of shifting, changing physical sensations, which vary in intensity over time. The less you identify with the pain, the less mental anguish you experience and the more manageable it feels. As you can see, you can go as deep as you want with this. There’s always more to discover. It gets really interesting! At the same time, remember to respect your body. This isn’t about being macho and seeing how much pain you can endure. If the pain is really intense, feel free to do what you can to be more comfortable: move, stretch, stand up, take care of yourself. Just do it mindfully! Observe the physical sensations and the stories you’re telling yourself while you’re doing this and see what amazing and interesting things you discover! That’s it for this video. I hoped you enjoyed watching it and learned some useful strategies for being mindful of pain. If you like this kind of stuff, you can subscribe to my youtube channel and get automatic notifications whenever I release a new video. I’m Nick Grabovac. Thanks for watching! Good stuff! Thanks for sharing?